Ever since 2007’s Grindhouse theatrical release, this form of story telling has caught the attention of old-school movie goers everywhere once more. From cinema to games, right down to comic books and so many other artistic formats, this style has found its home once more. 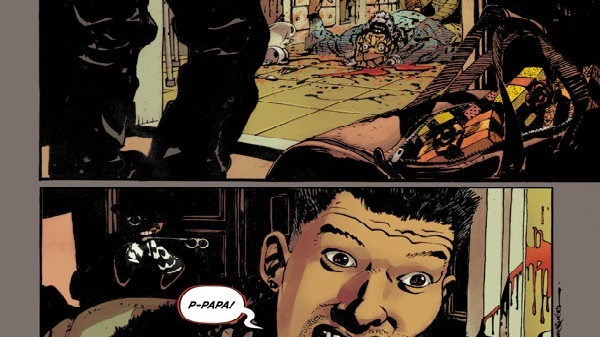 Among those venturing down the path is Dark Horse Comics with their recently released Grindhouse: Drive In, Bleed Out mini-series from writer Alex De Campi and artist R. M. Guera. But does this new entry into the world of grindhouse pay homage to the classic style, or is this a far less enthralling mini-series? 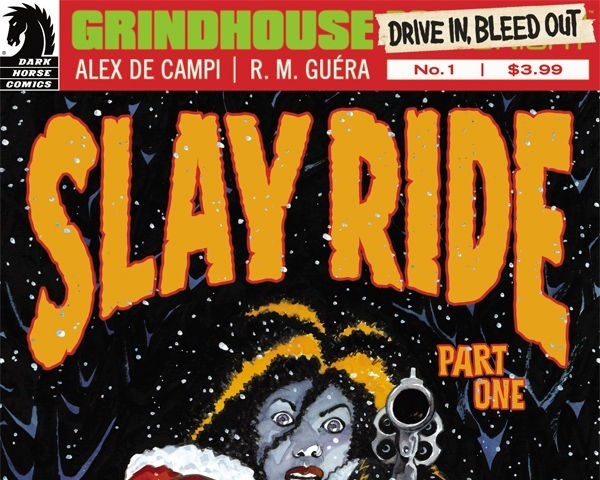 This first issue of Grindhouse: Drive In, Bleed Out is only the first of two parts to the Christmas themed tale titled Slay Ride. The madness starts early as younger brother Jake comes home on Christmas Eve to find his father has been murdered. 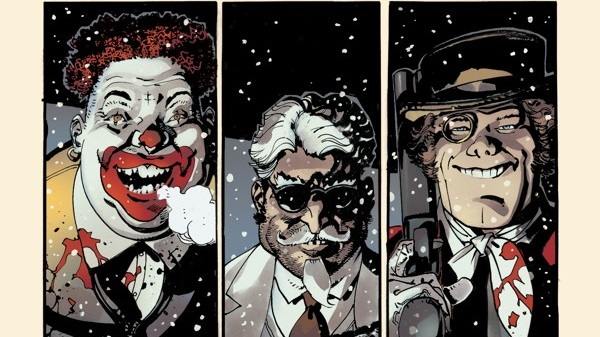 Jake’s mother, who is outside in the car, happens to see the killers, which includes The Clown, The Overseer, and The Man Who Walks. After being passed up by the trio, the mother reaches out to her daughter who reluctantly returns to the house of the parents she despises due to childhood issues, alcohol, and being thrown out. Predicting the actions of the police, the mother decides they need to stop the killers before the strike again, setting out in their horse drawn sleigh for their neighbors in the distance. 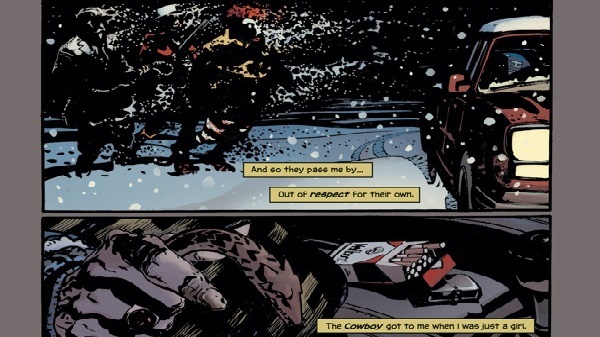 The thing about this chapter of Slay Ride is that it has the potential to be a solid story of three people randomly going around on a yule-tide killing spree. Instead, we’re greeted with more of a paranormal side. The daughter starts putting things together upon reaching the next house to find bodies hanging from the trees, realizing these three are out to hurt bad people within the ly spaced out community. This summation includes her father as well. However, very early on, the trio seem to vanish in front of the grandmother, and even reappear like dust in the wind inside on of the buildings. There’s also a brief battle between two children that were apparently aborted years ago as the kids of the family in that particular house that were murdered. The innocent faces of the youths are replaced with demonic eyes, fangs, and even a snowy ground that seems to open up like a mouth. It’s an interesting concept that could potentially play up the idea of literal Christmas magic, but in the end only makes a gritty Thriller into a cheap paranormal Horror tale. The artwork, however, is just great most of the time. This chapter of the story only clocks in at twenty-four ad-free pages without much dialogue or narration. Much of it is told visually through the rougher hand drawn art style. R. M. Guera and colorist Giulia Brusco do a fantastic job of capturing the sensation of the grind-era through the whole issue, not to mention a desolate Christmas Eve setting. You never quite feel like the characters are too isolated, but you know very well it’s that hour where normal, sane human beings are typically asleep. And that’s the other major problem. While this first part is good for what it is, Slay Ride itself just doesn’t quite feel like its worth the four dollar (US) cost. Yes the lack of ads is great, not to mention the thicker, glossier paper used that adds a little extra weight to the pressing, but it just feels like a great deal of story and character development is sacrificed for it all. Even when you learn of the daughter’s sordid sexual exploits you only get one page of graphic depictions, not to mention some forced dialogue about the history between her and the mother that in no way seems like a natural occurrence. These two kind of go out of their way to paint the husband as a bad man, countering it with the daughter’s own goings on, all of which seems like a huge amount of obvious foreshadowing. But, there are some added bonuses to splurging for the physical edition. There’s a brief comic strip on the outside back cover called Li’l House of Grind. It’s a simple nine-panel Archie style tale called Kung-Fu Cheesecake, which follows a former waitress who was treated poorly and is out for revenge by switching her head with a cheesecake and learning karate. It’s a very odd theme, but it gets the job done in that very small amount of space, making it a nice additional touch for the money you spend on these twenty-four pages. There’s also a few “coming attraction” posters in the back that are a nice touch and, hopefully, will see light in this series further down the line. Had there been a little more room to flesh out some back story as to who any of these people are and not forcing development into brief bite-size chunks, you might actually start to care a little more about the goals and intentions of the parties involved. Obviously the final product will only be a total of forty-eight pages since this story concludes in the second part, but hopefully the next chapter will have a little more depth for the players involved. But, if you have the money to spare, Grindhouse: Drive In, Bleed Out seems like an interesting idea that, at this point, could have been executed a little better.